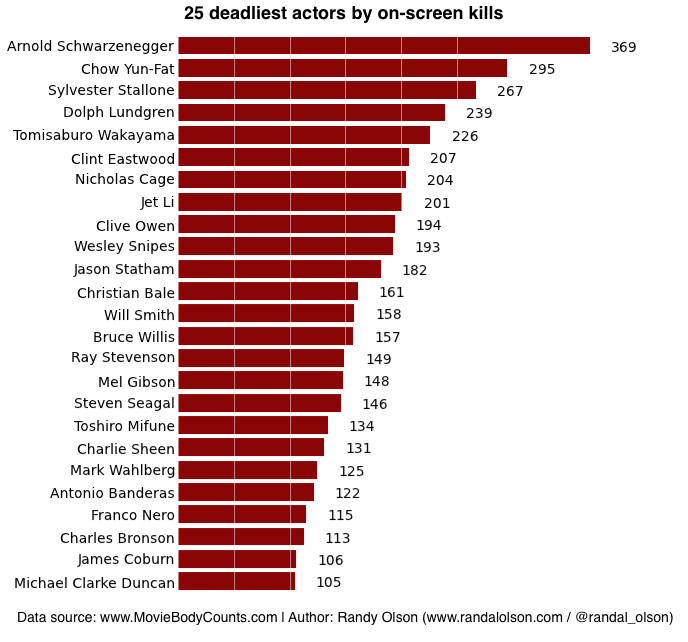 A computer scientist has created a fascinating chart of top 25 deadliest actors of all time by on-screen kills. 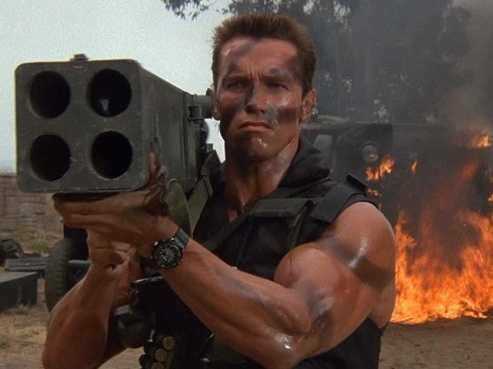 Drawing on the MovieBodyCounts database, Randal Olson created a mostly complete list that shows that Arnold Schwarzenegger is the deadliest man in movies. • Uma Thurman is deadliest woman with 77 on-screen kills. • 150 of Tomisaburo Wakayama's 226 kills came in the film Lone Wolf and Cub: White Heaven in Hell (1974). It is considered the highest kill count by any one person in a film. (I've actually never heard of the Lone Wolf and Cub movies, but there appear to be a lot of them). The body count database took more than five years to build, but some kills may be missing from the list because "some actors have worked in dozens of low-kill-count, B-rated movies" that haven't been cataloged. Olson added that there is one key omission in the database: John Wayne. "I'm almost certain he'd be ranked in the 'deadliest actors' chart if some film-watching hero were willing to do the counts on his [pre-1960] films. That said, it may be best to qualify that these counts cover the period of 1960 and onward." Olson also charted the deadliest films and most violent films of all time based on the kill count data. Chuck Norris is going to roundhouse this list, right in the head!! Not even close. James Arness. If this were a list of the "25 Deadliest Forces of Nature," Chuck Norris would be in 30 of the top 25 spots. The Lone Wolf & Cub movies are great...you can get them from Netflix. The star later went into politics and I expect that everyone was scared of him. Peter Cushing played Grand Moff Tarkin in the movie: Star Ware, Episode IV. A New Hope. He blew up one of the Core Worlds to make a point. Now Hollywood is the modern amount in the word. The most popular movie in Hollywood word is now Bluray and 3D Movie. University of the Arts Rejects Student Demands to Fire Camille Paglia - "The university's president, without naming her, issued a strong statement defending academic freedom"